Race, ethnicity and culture expressed in art. This painting still needs work, but I wanted to see what it would look like online and solicit comments. There is a lot more work to be done, especially on the clothing. 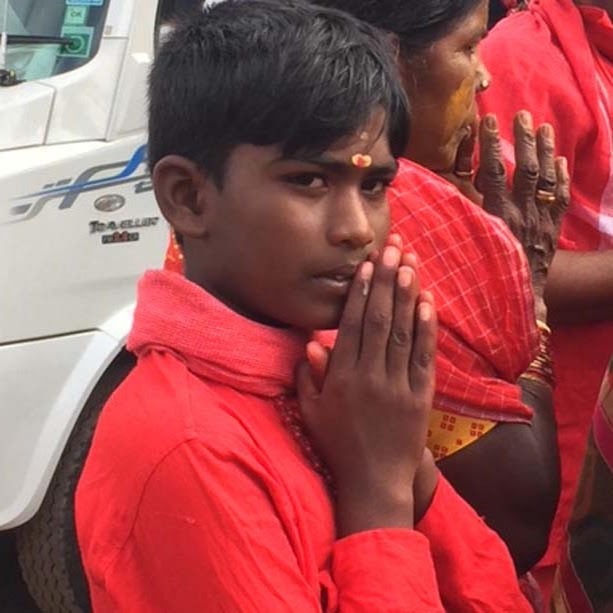 The photo of this boy was taken in Madurai, Tamil Nadu at the Meenakshi Temple. In the south of India holding the hands together in greeting is called namaskaram which is the same as namaste. This price includes tax and shipping within the US. 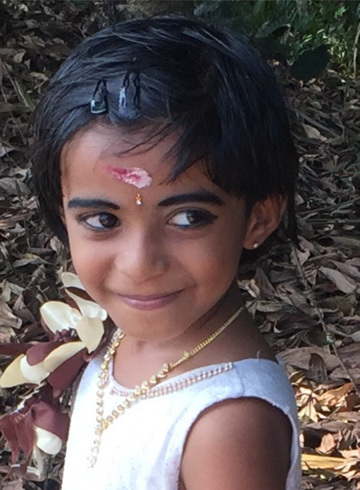 This young girl was standing on the side of a canal in the backwaters of Kerala, India. I was attracted to her impish face and kohl lined eyes. The kumkum mark on her forehead means she has been at a religious festival. Her actual corsage was made from ribbons, but I changed it to orchids because so many are cultivated in Kerala. 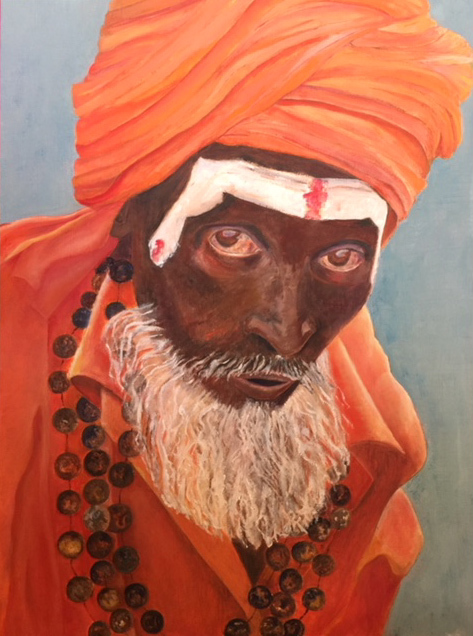 Extreme monsoons and flooding are laying waste to this state and its people now, August, 2018.
size - 20" x 20" x 2"
This is a Sadhu or holy man I encountered outside the Sri Meenakshi Temple in Madurai, Kerala, India. 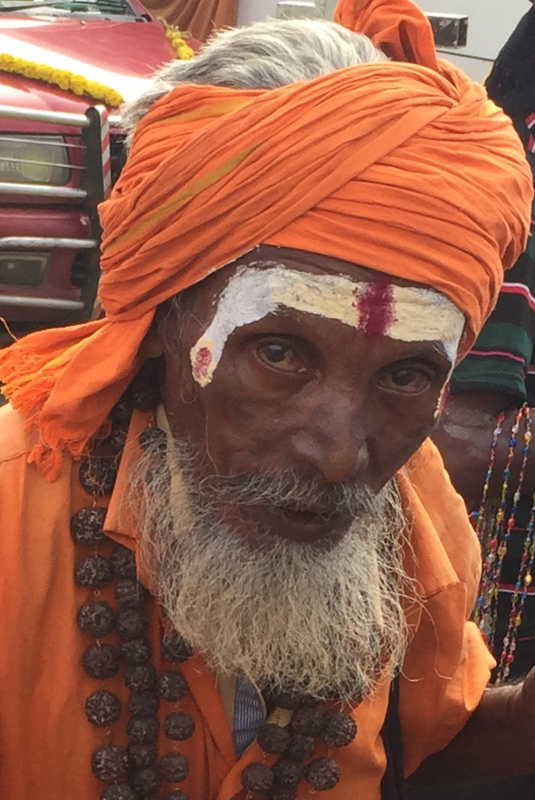 Sadhus are religious ascetics respected by Hindus and Jains. There are Kumkuma powder markings on his face. size - 18" x 24" x 1"
size - 20" x 20" x 1"
Julia knit sweaters for Hallet Handknits during the 1980's. 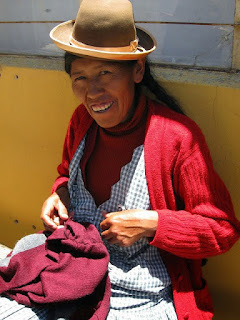 She is wearing the typical apron and bowler style hat used by the Quechua Indians of the altiplano. Note the circular knitting needles. This made the finished sweater seamless at the sides. This Pa O woman is a towel seller from Myanmar. She has a towel wrapped around her head and in her arms are more towels. The turban head dress is typical and often red. The Pa O are the seventh largest ethnic minority in Burma and the second largest in the Shan State. 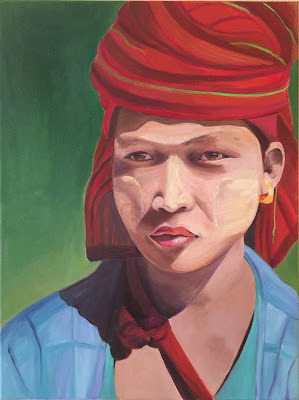 They are believed to be of Tibeto-Burman lineage, and share the language and culture of the Karen people. Unlike the Rohingya, they are a recognized ethnic group in Burma and Buddhist. However, due to military conflicts and lack of economic opportunity, many Pa O have migrated to northern Thailand. 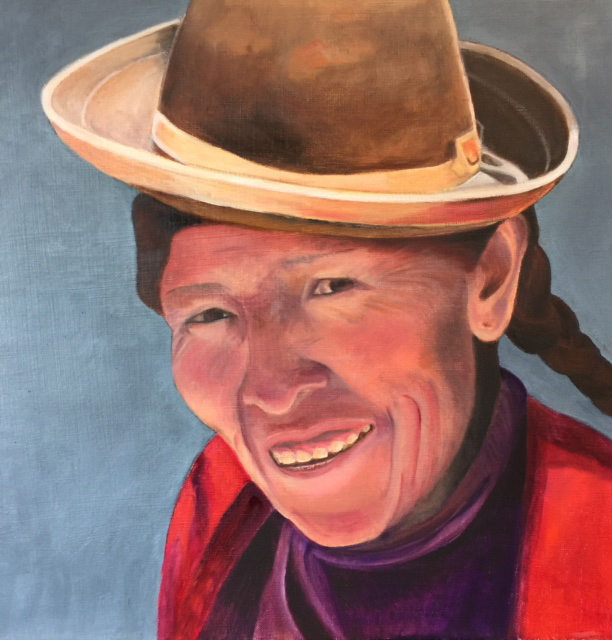 This is an oil painting from a photo I took in Myanmar of a local woman selling avocados. Note that the light yellow line on the nose and right side of the face is not a highlight, but thanaka cream that is used for sun protection and as make-up. Locals rub the bark of a tree on round stones and add water to make this paste for use by men, women and children. I love to try and capture people in photos and then make them into art, in this case oil paint. This man was standing on a beach of the Irrawaddy River in Myanmar at sunset. He actually has on a t-shirt that says NASA. I did not paint the logo, but that t-shirt has definitely traveled! This is one of my favorite pictures from Cambodia. 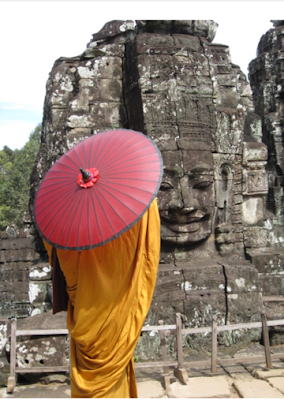 There are 200 carved stone heads in the 12th century Bayon temple of Angkor Thom outside Siem Reap, Cambodia. I love that they are all smiling. I plan to make this photograph a painting soon! 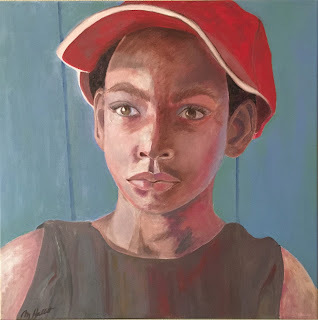 I visited the Las Lajas center near Cienfuegos, Cuba in June 2016 and saw this boy. I was touched by his "old soul" look. A member of our tour group had just given him an oversized SF 49rs hat. It sits heavily on his head. He is wearing a shirt that was made from a sack so the brand new hat is in stark contrast. The background is a colonial blue door typical in Cuba. 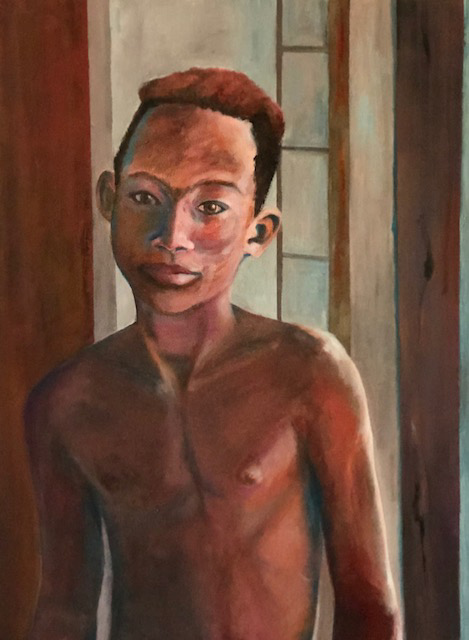 Young Cuban boy standing in the doorway at the Casino de Cuba Santaria building. Note the faded colonial blue of the frame. Santeria (Way of the Saints) is an Afro-Caribbean religion based on Yoruba beliefs and traditions, with some Roman Catholic elements added. The religion is also known as La Regla Lucumi and the Rule of Osha. Santeria is a syncretic religion that grew out of the slave trade in Cuba. size - 16" x 20" x 1"
Marsha Hallet's original oils are for sale and priced as indicated. Tax and shipping within the continental US is included in the price. Additionally, archival giclee reproductions can be ordered. 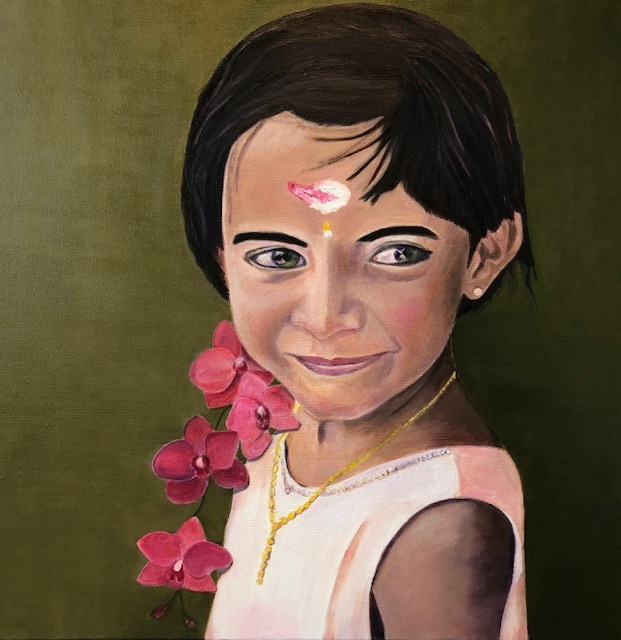 Please complete the contact form for information about individual portrait sizes and prices in giclee. Or contact me to commission a portrait for you. See examples of family portraits here. 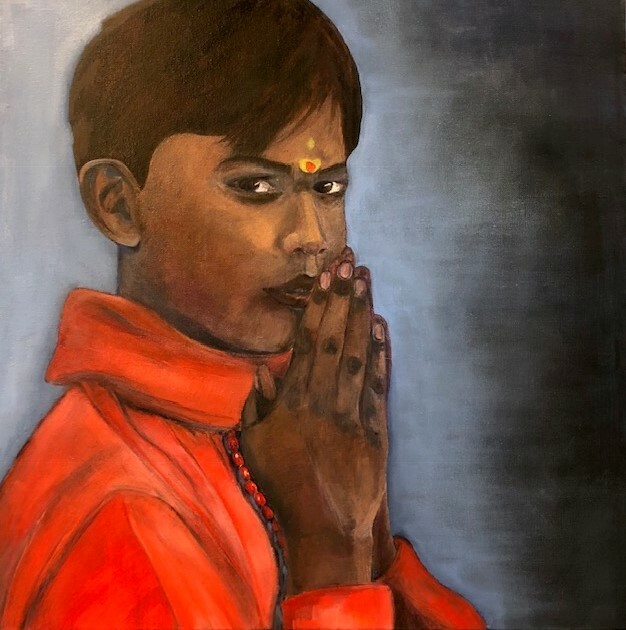 My paintings and photographs are of people with whom I have had a conversation and a momentary connection and who have given me permission to take their photo. 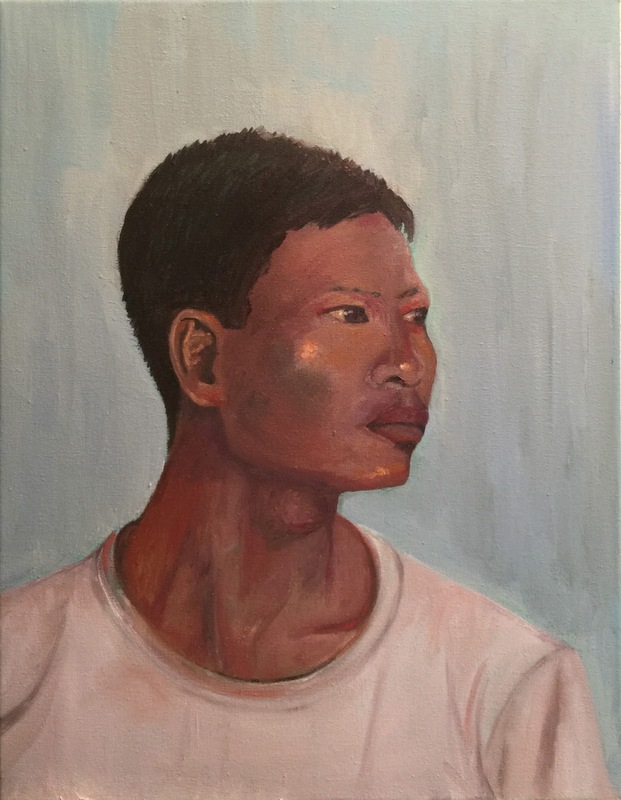 My passion is to preserve images of people not yet transformed by globalization. 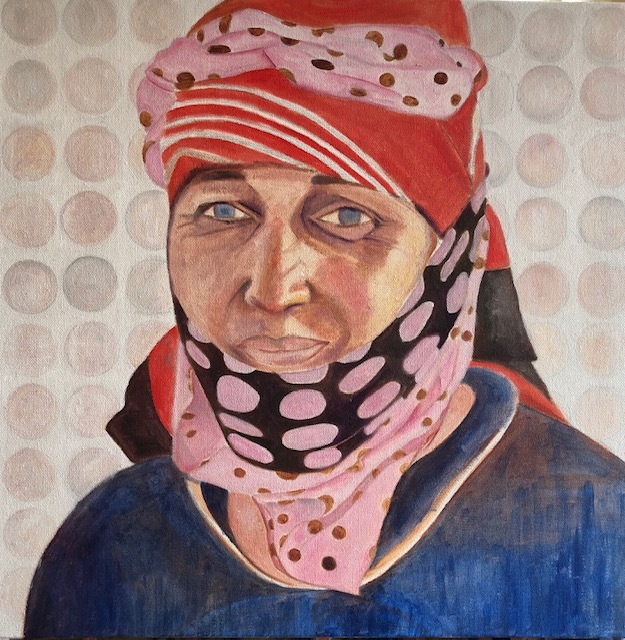 Before acculturation takes hold, I want to document people who live a traditional life. 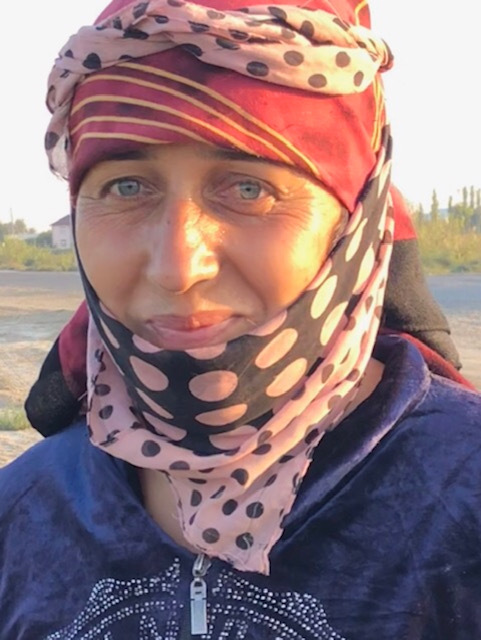 I hope you find beauty in the diversity of these world faces. My educational background includes a Bachelor of Arts degree from Stanford and an MBA from the Anderson School at UCLA. I have 30 years of experience in the fashion industry as a sweater designer and successful entrepreneur. I am currently in a two year docent training program for the Fine Arts Museums of San Francisco in 2018. 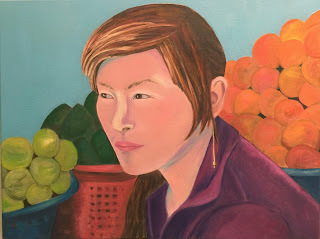 I have studied drawing and painting at City College San Francisco and the College of Marin. My paintings and drawings have been selected for several juried shows at City College San Francisco, College of Marin, and the Marin County Fair.